Ferrari V12 365GTB/4 wooden daytona motor, full size. Made out of rare woods. Only 12 made by Bill Dietz in Moss Landing, California. These engines were made over a 3 year period, using photos and a actual daytona engine. The motor weighs 50 lbs it took over 400 hours per motor to build. Each is serial numbered hidden in the block. 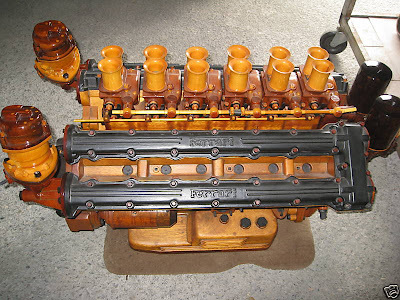 The block is made of Phillippine mahogany, the pressure plate and pulleys of wenge, the carbuetors are teak with maple, velocity stacks and the oil filters are made from padauk, the starter and twin distributor caps are walnut while the distributor itself, as well as the cam end covers, are made from honduras mahogany. All the screws, bolts, and studs are birch, and the waster pump and inlet are made from Hawaiian koa, the oil filter base is walnut, the springs and coils are natural wood caning, and other bits are made from oak. The cam covers are the only painted parts. When the pieces were all assembled, they received up to 10 hand rubbed coats of marine varnish for protection. These motors sold for $25k when finished; some as high as $49k on the secondary market. They were featured in Road and Track and Cavalino. The motor sits on a oak base with a brass plaque saying "365GTB/4 Daytona motor." It has a Plexiglas case that has some scraches and should be replaced. This engine is in perfect shape and has graced my living room for years. It's a joy to look at and the details are amazing. I'm downsizing to living in a boat and have no room for this masterpiece. We can ship anywere in the world at buyers expense, very reasonable reserve, bid to win.